Witness the historic sites and vibrant cosmopolitan life of Dubai as we take you on this city tour. We shall fake you to the pictures que palace and this residential area which is the home of the famous Jumeira Mosque. A full view of the city can be seen as we then proceed to the World Trade Centre. The famous Sheikh Saeed House (former residence of the ruling family) would be our next stop. This ancient palace with wind-towers (an ancient form of air-conditioning) and layers of rooms built around a central courtyard, shows us a fine example of the region's traditional architecture. Our drive continues to the old part of the city, the Bastakia area, to the Dubai Museum at the Al Fahidi Fort which was built 150 years ago. 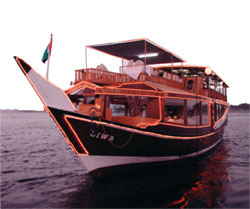 Experience the unique ride on an ohm (traditional water-taxi) across the Dubai Creek to the Deira side of the city. This tour is incomplete without a visit to the fascinating souk of gold and spice Take a trip to the past. A full day tour to Abu Dhabi, the capital of the UAE, situated about 170 kms. South-West of Dubai is an interesting excursion. The first landmark before reaching the city of Abu Dhabi is the Jebel Ali Port, the biggest man-made port in the world. Many of the city's striking examples of modern architecture show intriguing interpretations of Islamic themes captured in today's materials. Admire the skill and dexterity of local ladies making traditional handicrafts at the Women's Handicraft Centre. We then drop by at Abu Dhabi's oldest building, Al Husn Palace, before proceeding to the Petroleum Exhibition. Learn everything about the 'black gold' - oil - and how it transformed Abu Dhabi into a city what it is today. A drive along the beautiful Corniche and to the Breakwater gives a magnificent view of the city. The last stop shall be at the Dhow Yard, where wooden ships are still built using simple tools. A trip to the desert offers a taste of the true heartland of Arabia. This safari tour takes you right into the heart of the desert where you experience the excitement of a roller-coaster ride into the magnificent red sand dunes while remaining mobile on the shifting sands. A brief stop for a breathtaking view of the endless desert will give you an opportunity to watch the sun set over this tranquil solitude. Enjoy the contrasts of desert night at our 'AL SHAMS! BEDOUIN VILLAGE' and dressed in the traditional Arabic dress, enjoy the camel rides, the amazing falcon show training, savour the aromatic Arabic coffee & tea, wander around the camp, or just simply laze around the bonfire. Feast on the delicious BBQ Dinner with Arabic specialties cooked on site. A belly dancer swaying to the rhythms of Arabic music shall entertain you. Join the fun and stomp your feet on the dancefloor to wind up your night. Ever experienced a night under million of stars? Come with us as we take you out of Dubai by our luxurious 4WD vehicles and into the magnificent red sand dunes for a breathtaking roller coaster ride. A few minutes stop for refreshing cool drinks give us an opportunity to record the rare moments in the desert with the sun slowly shedding off its light - a spectacular sunset in the desert. Our drive then continues and shall take us to a village that is practically in the middle of nowhere - the 'AL SHAMSI BEDOUIN VILLAGE' Don with the traditional Arabic dress, enjoy the camel rides, sip on the aromatic Arabic coffee, tea, try the 'shisha', watch the amazing falcon show training, sit around the bonfire, or just simply laze on the carpets and pillows set for you. A delicious BBQ Dinner with Arabic specialties cooked on site shall be served to you at around 20:00. The beat of an-Arabian music brings out the best of the belly dancer as she swings to the beat. You may join in with the fun and get yourself into the dancefloor to wind up your night. The calmness of the desert and the beauty of the Arabian skies littered with million of stars will give you a feeling of tranquility as you end up your day. Sunrise the following morning signals a hot breakfast, which shall be served to you before coming back to Dubai. A full day tour which takes you through the Northern Emirates, passing through the Oasis town of Dhaid and Masafi. Our first refreshment stop is at the Friday Market - which amazingly opens daily - then a visit to the 14th centuy Bithna Fort. Our drive continues towards the Emirates of Fujairah, and stop at this old town before heading to one of the beach hotels for swimming and lunch. After lunch we head off for the last leg of this excursion to the scenic fishing village of Dibba. From there we head back to the mountains with a drive through the mountain village of Khassab where the friendly Shihu Tribes still live in houses built of rock. This full day tour which begins with a visit to the oasis of Al Dhaid and Masafi before reaching the village and port of Dibba This small village is located at the base of the magnificent Hajar Mountains. Our drive crosses the Musandam Peninsula on dirt tracks through the winding gorges up to a height of nearly 1200 meters. From there, you would be able to view the fascinating cliffs and deep canyons. Lunch is usually served at a famous 5 Star Hotel in Fujairah. This tour combines two starkly contrasting landscapes. We will head for the magnificent mountains of the UAE as our 4WD vehicles take you out of Dubai towards the golden sand dunes. We will visit Bedouin farms and camel camps enroute stopping for a short break among the dunes before driving into the mountains and the old village of HATTA -Dubai emirates' only mountainous resort. so on. The character of trip depends on the kind of shopping you want make. Camels are said to be God's gift to the Bedouins. People in the early days used the camels either for trading or for transporting goods from one place to another. Journeys are always done in-groups, otherwise known as caravans. Camels endure the strong winds in the desert thus referred to as the 'ship of the desert'. It's ability and strength to go in far distances for a long time without food and water made these wonderful creatures so valuable and a part of the Arabic tradition. Cross the fascinating red sand dunes by camels. Experience how people in the early days cross each emirate to find a new place for dwelling and for trading. This tour starts at 9:00 hrs and at around noontime, settles into a shady area for lunch and departs for Dubai with our 4WD vehicles shortly after 14:00 hrs. As a sundowner, the late afternoon excursion departs from Dubai by 4WD vehicles at around 15:00 hrs with BBQ dinner and an overnight stay at the 'AL SHAMS! BEDOUIN VILLAGE An early morning breakfast shall conclude this adventure where you truly experience the real Bedouin life. This tour combines two starkly contrasting landscapes. Here we head for the magnificent mountain of the UAE on luxury 4WD vehicles. The first leg takes us out of Dubai towards the golden sand dunes. We then visit the old village of Hatta, Dubai Emirates' only mountainous resort. Here we make a trip into the past with a visit to Portugese Fort which was built in the 14th century. The village of Hatta with the majestic mountains backdrop, offers excellent photographic opportunities. We continue driving through the wadis until we reach the mountain pools where you will have an opportunity to swim in its cool refreshing waters. Lunch shall be served at the Hatta Fort Hotel After a few minutes rest, you will feel the real experience of an Arabic Bedouin life when our safari drivers will take you an excursion in the desert. Experience the thrilling roller-coaster rides on the sand dunes, and watch the, beautiful sunset before proceeding to the WL SHAMS! BEDOUIN VILLAGE -a place that is practically in the middle of nowhere. Don with the traditional Arabic dress while you take the camel rides, sip the aromatic Arabic coffee or tea, watch the falcon show, sit around the bonfire, or just simply laze or wonder around. A delicious BBQ dinner shall be served consisting of Arabic specialties cooked on site. A belly dancer performs right after dinner and you may join in the fun at the dance-floor before heading back to Dubai. The program is the same as Adventure Tour, with the differnce that you will be provided by accommodation and breakfast next morning. This is a truly wonderful experience of seeing the city of Dubai at night. On board an Arabian Dhow boat, cruise along the creek and see the 'City of Lights' while you enjoy your sumptuous dinner with Intercontinental menu set for you. This is a unique two and a half hour experience where you glide gently past illuminated souks, banks, and palaces - a truly very relaxing evening.